Sharks have always gotten a lot of bad press, but since the blockbuster movie “Jaws,” their teeth have garnered the attention of active imaginations. They are big, sharp, serrated and immensely intimidating -- especially when viewed close-up and still in the shark's mouth. The fact that most sharks have so many of those knife-like ivories -- usually about five rows, adding up to around 3,000 teeth at any given time -- only adds to that terrifying wow factor. When a shark loses a tooth -- usually about one per week, from getting it stuck in its prey where it is pulled out or broken -- it can replace it in a single day. Because shark teeth sit in cartilage rather than bone like our own teeth do, they may dislodge more easily. Fortunately, the extra rows of teeth always growing in at the rear of the mouth can rotate forward to replace the losses, so you will never see a naturally toothless shark. 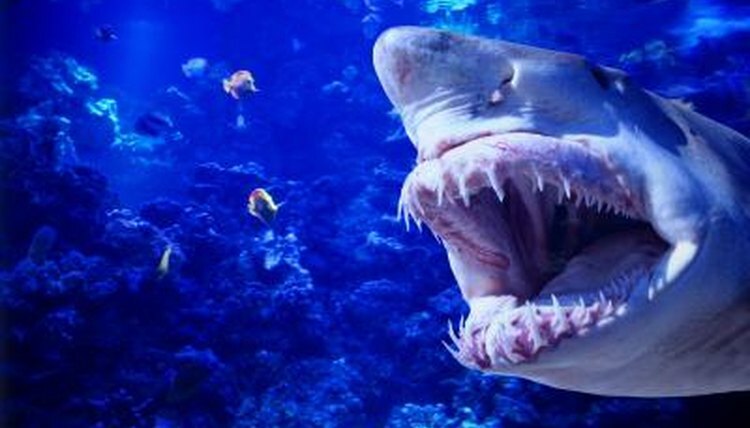 That's good news for sharks because they cannot chew their food, and rely upon all those teeth and some vigorous shaking to tear their meals into bite-sized bits they can swallow whole. Of all the currently living fishes, great white sharks are the largest predators and the most universally feared. However, despite a 300-plus-strong arsenal of impressive triangular-shaped, serrated teeth, they rarely attack humans. Their natural prey consists primarily of seals and seal lions, small whales, sea turtles and carrion. Of the 100 or so annually recorded shark attacks, great whites do account for more than half, but scientists now think that most of those are what they term “sample biting” out of sheer curiosity, rather than predatory inclinations. Sharks have great dental hygiene. Not only do they endlessly replace missing teeth -- effectively eliminating the need for dentures -- but their teeth are coated with acid-resistant fluoroapatite enamel that makes cavities virtually impossible. The hardness and impermeability of shark's teeth are responsible for their relative abundance in the fossil record. Despite the stereotypical idea of sharks with boatloads of scary teeth, some of the largest sharks have some pretty non-scary choppers. The monstrously large whale shark and the almost equally colossal basking shark have no obvious teeth, but instead sport an array of bristlelike structures called gill rakers, which they use to filter tiny crustaceans, plankton, fish eggs and diminutive larvae into their cavernous mouths as they slowly swim along with their jaws open. What Kind of Color and Markings Do Sharks Have?